Following a deadlock between the leaders of Pakistan People’s Party (PPP) and Mutahidda Qaumi Movement (MQM) for a coalition, PPP leader Rehman Malik seems to be in hot waters as a group of Sindhi lawmakers belonging to his own party are reluctant to vote for him in the upcoming Senate polls scheduled for March 5, Pakistan Today has learnt. PPP’s Malik, who was otherwise aiming at securing the top slot of the Upper House, has landed in a tight corner as many of the PPP MPAs are reluctant to vote for him this time around. Sindh Assembly is set to elect 11 new members of the Senate on March 5, including seven general seats and two each for technocrat/ulema and women. There are 168 total members in Sindh Assembly. However, four members of Pakistan Tehreek-e-Insaf (PTI) have submitted resignations, while Irfanullah Marwat has been disqualified. Hence, there would be 163 members eligible to vote. This means each candidate for a general seat would have to win at least 24 votes while each candidate to be elected against reserved for technocrat/women would require 55 votes. In the 168-member Sindh Assembly, the PPP have 91 members, while MQM has 51, PML-F 11, PML-N eight and NPP have two legislators. The PPP have fielded Farooq H Naek for technocrat and Sassui Palijo for women seats while former interior minister Rehman Malik, Islamuddin Shaikh, Saleem Mandiviwala, Engineer Gianchand and Abdul Latif Ansari have been fielded for general seats. The MQM has fielded new faces for the Senate elections. The MQM has chosen its Punjab President Mian Ateeq and Raza Zaidi for general seats while the party’s Khyber Pakhtunkhwa President Barrister Mohammad Ali Saif has been awarded party ticket for technocrat and Nighat Mirza will contest for the reserved seat for women. Sources in the PPP and MQM have disclosed that the stalemate in talks between both the parties was a major blow for Malik, also known as having a “magic wand” for bringing the leaders of both the parties together. However, this time around, his “tilt” toward the 90 headquarters of MQM was proving to be a “liability”. In terms of statistics, the PPP candidates against women and technocrat seats will easily win their seats. The five candidates may also sail through easily. But the reluctance by some party lawmakers to vote for Malik has complicated the situation. MQM has 51 members in Sindh Assembly which means that its two nominees for general seats would also win easily. However, if the house goes for voting, MQM candidates Barrister Saif and Nighat would require four more votes from other parties. Malik is playing on MQM’s weakness and in a bid to increase PPP’s bargaining position, he has filed his papers against a technocrat seat to give a tough time to Barrister Saif, sources said. “Though PPP is a ruling party which enjoys a comfortable majority in Sindh Assembly, Malik is largely unpopular among the lawmakers from interior Sindh due to his tilt towards MQM. Since there are already reports suggesting Malik may be elected as Senate chairman, a rebel group has emerged within PPP which is campaigning among fellow lawmakers not to vote for him,” a source in the PPP informed Pakistan Today. “The situation has pushed Malik in a tight corner. In desperate attempts, he is in touch with the MQM chief Altaf Hussain, seeking support of MQM voters for his general seat. However, in order to increase his bargaining position, the former interior minister has also submitted his papers for a technocrat seat,” the source added. The source said that the group led by MPA Hassnain Mirza, the son of outspoken PPP loyalist Dr Zulfiqar Mirza, is pleading the Sindhi lawmakers to take advantage of the secret ballot and do not vote in favour of Malik. “The group members are motivated under the influence of Dr Mirza. Many of the lawmakers have sworn on Quran not to vote for Malik even if they would have to waste their vote,” the source said. The source added that the PPP leadership was aware of the fact, hence, desperate efforts were being made by the ruling party to secure a deal with all the forces in the Sindh Assembly including MQM and other smaller opposition parties and get their share according to their strength in Sindh Assembly. “The rebellion has forced Rehman Malik to focus his efforts to win support from lawmakers of smaller parties and lucrative offers of cash and kind are being made to win votes from PML-N, PML-F and other smaller groups,” the source said. “If these efforts would fail, no one knows the fate of Malik. It would be a huge blow to the reputation of Zardari if Malik fails to win election,” the source added. When contacted, Malik told Pakistan Today that he wished to contest against a general seat, but the party would take a final decision. He hastened to add that a 7-4 seat adjustment had already been agreed between PPP and MQM. He also said that a final round of talks with MQM was likely to be held today (Tuesday) after which the party will take the final decision. Asked whether a group of PPP lawmakers were lobbying against him, Malik said he had no such information, adding that Dr Zulfiqar Mirza had already left Pakistan. He said that if anyone had personal enmity against him, he could not comment over it. “I am a Sindhi resident since my student age. I got post-graduate degree from Sindh and also got my vote registered there while studying there. There should be no doubt on my credentials as a Sindhi. 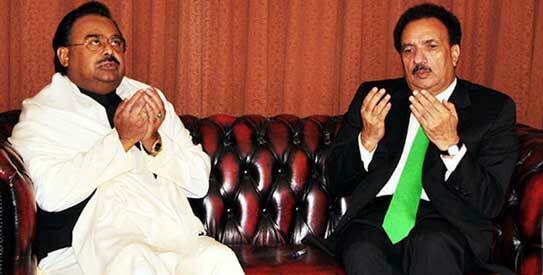 I would not be contesting as Rehman Malik, rather I would contest as a PPP worker,” he maintained. A source in the MQM, however, said that his party would only go for an understanding on technocrat and women seats. In such a case, the MQM and PPP candidates may win unopposed. The recent situation has forced both the parties – the MQM and PPP to seek support from minor parties having a thin representation in the Sindh Assembly. A source in the MQM told Pakistan Today that the party’s leaders had contacted the PML-F in a bid to seek five votes for its candidates vying for technocrat and women slots. “The MQM has offered the PML-F to give its additional votes to the PML-F candidate Imamuddin Shauqeen for general seat,” the source said, adding the PML-F candidate could also win a general seat if it manages to win support of eight lawmakers of PML-N voters and two of NPP. “However, in such a case Imamuddin or PML-N nominee Syed Zafar Ali Shah would have to withdraw and consensus would have to be evolved for one candidate,” the source added. Moreover, the PML-N also is facing internal split as almost all its lawmakers are unhappy with the cold shoulder given to them by federal government. Shirazi family has a strong public support in Thattha and its leadership feels disenchanted with Prime Minister Nawaz Sharif for lack of support to them when the Sindh government victimised the Shirazi family by lodging “fake criminal cases” against them. Moreover, former Sindh chief minister Arbab Ghulam Rahim has also formed a new group comprising five former chief ministers against PPP regime including Syed Ghaus Ali Shah, Liaqat Jatoi, Elahi Bux Soomro and others. So Arbab Rahim, with other party lawmakers including Liaqat Ali Khan Jatoi and Shafi Muhammad Jamot may support the PML-F nominee rather than Syed Zafar Ali Shah. A source in the PPP informed Pakistan Today that the party was in touch with some lawmakers of PML-F and PML-N and it hoped some of they would support its candidates. “We are in touch with PPP MPAs Dr Mehtab Akbar Rashidi and Imtiaz Shaikh. We will also win support of other PML-F members. Moreover, we already have won support of Shirazi group of Thatha and its MPAs Aijaz Ali Shah Shirazi, Shah Hussain Shah Sheerazi and Amir Haider Shah Sheerazi may support PPP’s nominees,” the source concluded.